I really like .me, I am pretty sure it will not make .com moot, so we can get that out of the way, and I am not in a .me cult or anything like that, but I am liking the extension, it has been good to me. I never really did much investing outside of .com, .net and .org but I had started getting a few .tv earlier in 2011 and was turning some of them so I thought I would get some .me also and see how that goes. So one night in Sep 2011, not so very long ago, I grabbed my first few dropping .me, I was hesitant but figured I would give it a shot, they were only $7 but still I went to bed that night wondering if I was doing the right thing or if this was just another great money pit idea like others I have had. I woke the next morning with .me on me mind, I was really considering deleting the registrations (you can still do that at Dynadot.com) and forgetting about .me. I figured I didn’t partake in the goldrush of ’08, I couldn’t be sure if it was just another .mobi or .us moment so I stayed away, so why start now 3 years later? I hesitantly considered them because the extension was growing on me and I was seeing some sales and sites, and I theorized if the public starts getting more familiar with all the new TLD’s coming .me and .tv were as good as any imo, maybe better, I understand they are ccTLD’s and not gTLD’s. Anyway when I fired up my laptop the next morning thinking, “to .me or not to .me, that is the question”, I find an email inquiry on one of the names I had grabbed 12 hours earlier. It was one of those slightly awkward moments when the buyer knows that I had just registered the domain, he said that he had put in backorders at some sites but they did not get the domain. I explained that it was a good domain and buying and selling generic domains was my business, it’s what I do, I have time and money invested, not so unlike the backorder or auction services he would have paid for if they had got the name. I agreed to sell the domain to him for $500, I know $500 is not much but it was enough to answer the question, “to .me or not to .me?” the answer was “to .me” and I kept the others I also got that night like fragrance.me and saxaphone.me. After that I went a little crazy, now I have 100’s. I receive lots of offers and I recently sold my 100th .me, I have not made any huge sales but I have done OK, the majority I sold between $500 – $3000. I have turned down some larger offers on some and I am making more than I am investing. I have not scored any really great verb.me but I have got good single words, the shorter the better, I got a few huge 2 word terms but I do not get many inquiries on them so I am strictly sticking with single words and acronyms. I’m not setting the world on fire but I am making a good ROI so far and getting consistent offers that give that feeling of liquidity. I have sold some to people that are going to use them for apps, I have sold some to people that were using them as a shortcut forward to their YouTube channel, I have sold some to media companies that are using ****Media.com and bought the corresponding ****.me. 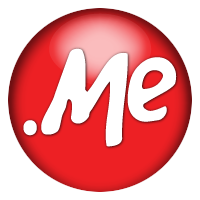 The .ME Registry, operator of the .ME Internet extension, have released five exclusive, premium domain names: Around.ME, Hire.ME, Fund.ME, Find.ME and For.ME making them available for acquisition by the applicants with the clever ideas for online business. The .ME Premium Domain Program which is currently open for applications is set to close June 15, 2013. These memorable .ME domain names are ideal for any company that wishes to brand themselves as unique and personal, or launch a new product using an exclusive name. All businesses, large or small, existing or start-up, are eligible to apply. Applicants will be judged on the quality of the service they are providing, their references and their business proposals. The winning applicants for Around.ME, Hire.ME, Fund.ME, Find.ME and For.ME are scheduled to be announced by July 1, 2013. To learn more about how to apply for one of the five Premium Domains, as well as the application and selection process, please visit Domain.me Premium Domain Program. Anybody else have an opinion or experience with .me? I love this article. Thank you for sharing it! My research team is looking at some of the new Gtlds and hate to say, some of them have lots of potentials. Consequently. this will affect the dot me/co…net/info..
Having invested in the stocks since 2010 and investments have gone up to 45%, it is a waiting period to SELL and buy other investments. Having that said, lots of public money is being diverted to stocks, real estate and lastly to….domains. There are still billions of cash sitting in the dust and investors are still waiting to invest in the market and there are those who had missed the bull run and waiting to put their money in the market. As they said, the waves keep getting higher and higher because the money is still flowing into the market and pushing the waves higher and further…. I don’t own any .me but I like the extension. It has some potential although it is somewhat limited. Assuming I am buying a generic 2 word domain and all .com .net and .org are taken. The .co and .me are still available. So, which one will you recommend to buy for resell/investment point of view? .co or .me? It’s a hard choice for me…..or just buy both? I agree and it clears my doubt. I won’t buy this 2 words in .co or .me name and will stick to single word in .me only. Great article Mark. .Me sounds well and many end-users believe it to be a personal extension rather than the cctld of Montenegro and that’s where it’s having the push. Further, I read that the middle east companies too pick .me because .me to them means middle east. Jotted you a note about how to run your own registries.